NEW YORK - SHOWTIME Sports and Premier Boxing Champions have announced the television lineup for SHOWTIME CHAMPIONSHIP BOXING® for the first half of the year. Airing 10 live world-class boxing events - featuring 12 world champions and 12 world title fights - PBC and SHOWTIME are establishing an industry standard for a top-flight boxing season and a level of organization never before seen in the sport. The schedule features more than two dozen elite fighters competing in boxing's deepest and most talent-laden weight divisions and boasts the largest collection of stars in the sport today. The slate offers seven matchups of top-10 ranked fighters, four matchups of top-five ranked fighters, four top-10 pound-for-pound rated world champions and one world title unification bout. Led by SHOWTIME and PBC, boxing experienced a renaissance in 2017 with established world champions Mikey Garcia, Keith Thurman, Danny Garcia, Deontay Wilder, Leo Santa Cruz and Anthony Joshua, alongside budding stars Gervonta Davis, Errol Spence Jr., Jermell and Jermall Charlo and David Benavidez. In 2018, all are taking center stage in the wake of the retirement by Floyd Mayweather, Wladimir Klitschko, Miguel Cotto and others. "The stars have truly aligned, and SHOWTIME and PBC will once again set the pace for a landmark year in boxing," said Stephen Espinoza, President, Sports & Event Programming, Showtime Networks Inc. "To continue with the positive momentum, our goal is to deliver the very best fights on a consistent basis to the broadest possible audience. This lineup delivers pivotal bouts with frequency and purpose - all free to our subscribers. SHOWTIME is far and away the No. 1 destination for boxing fans nationwide." The 27 fighters unveiled in this industry-leading lineup own 731 total wins, 106 world title victories and a staggering win percentage of .957. Fourteen of the fighters are undefeated and all but four have earned at least one world championship. Also included in this lineup are four of the consensus top-10 ranked welterweights, two of the consensus top-five ranked featherweights, and three of the consensus top-five fighters in the 154-pound division. The full slate of boxing events airs live across all SHOWTIME platforms - television, mobile and the network's internet streaming service. One of boxing's most highly regarded young champions, unbeaten IBF Welterweight World Champion Errol Spence Jr. (22-0, 19 KOs) kicked off the schedule with an eighth-round TKO of former two-division world champion and top-10 ranked welterweight Lamont Peterson (35-3-1, 17 KOs) in Spence first title defense. In the co-feature, undefeated IBF Lightweight World Champion Robert Easter Jr. (20-0, 14 KOs) won a close, split-decision victory over former world champion Javier Fortuna(33-1-1, 23 KOs) in an action-packed fight. Two-division world champion Danny Garcia (33-1, 19 KOs) returns to the ring to begin his quest toward another welterweight world championship. Garcia's long reigns at 140 and 147 pounds ended last March in a close decision loss to unified champion Keith Thurman. 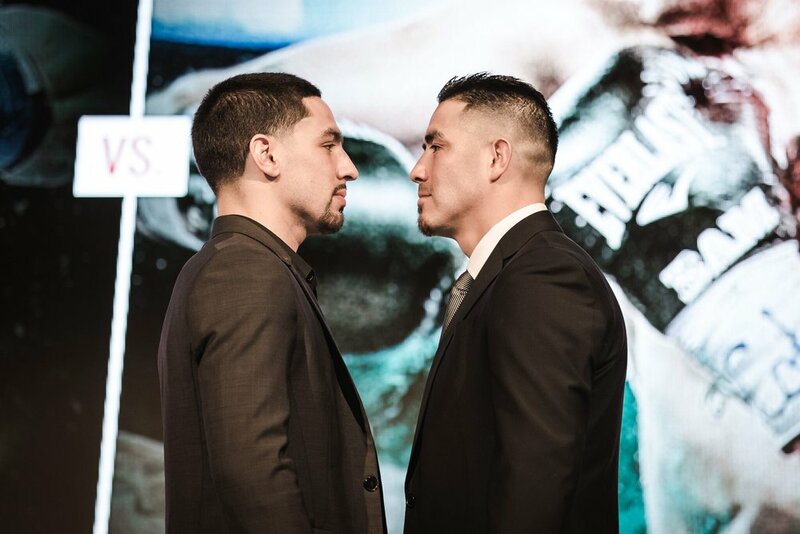 Now, Garcia will challenge tough former world champion Brandon Rios (34-3-1, 25 KOs), an all-action fighter who has fought the best in the sport. In the co-main event, boxing's youngest world champion, 21-year-old David Benavidez (19-0, 17 KOs), will make his first title defense in a rematch against top contender Ronald Gavril (18-2, 14 KOs). The super middleweights fought a thrilling fight last September that ended in a controversial decision for Benavidez. The revival of the heavyweight world championship division continues. America's undefeated, No. 1 heavyweight, WBC World Champion Deontay Wilder (39-0, 38 KOs),will face fellow unbeaten challenger Luis Ortiz (28-0, 24 KOs) in an anticipated matchup of consensus top-5 ranked heavyweights. Wilder has held the coveted green belt since January 2015 and made six successful title defenses. Now, Wilder faces a highly skilled Cuban pugilist with big punching power in Ortiz. The co-main event will feature former super welterweight champion and top middleweight contender Jermall Charlo (26-0, 20 KOs) taking on once-beaten contender Hugo Centeno Jr. (26-1, 14 KOs)for the Interim WBC Middleweight World Championship. One of the top pound-for-pound fighters in boxing, Mikey Garcia (37-0, 30 KOs) will attempt to make history by capturing a world title in a fourth weight class. Standing in his way is unbeaten power-puncher and IBF Jr. Welterweight Champion Sergey Lipinets (13-0, 10 KOs), who is making his first title defense. Two 140-pound titles will be on the line as two-division champion Rances Barthelemy (26-0, 13 KOs)looks to become the first Cuban boxer to ever win world titles in three different weight classes when he faces Kirly Relikh (21-2, 9 KOs) in a rematch of their controversial May bout, this time for the vacant WBA Super Lightweight title. WBA World Champion Erislandy Lara (25-2-2, 14 KOs) and IBF World ChampionJarrett Hurd (21-0, 15 KOs) will meet to unify titles in a defining moment for the 154-pound division. In 2017, SHOWTIME televised eight matchups featuring all of the top-five ranked super welterweight champions and challengers in an unofficial tournament. This unification match will pit the technical wizardry of Cuba's Lara against the strength and determination of Hurd. Four-division world champion Adrien Broner (33-3, 24 KOs) has established himself not only as one of the biggest draws in the sport, but as a fighter who is always willing to face the toughest competition. That will continue when he takes on undefeated former world champion Omar Figueroa (27-0-1, 19 KOs), an all-action brawler who never takes a step backward, as the former champions meet in a WBC Super Lightweight Final Eliminator. The co-main event will feature one of boxing's brightest young stars in Gervonta Davis (19-0, 18 KOs) as the 23-year-old undefeated former champion looks to regain his title. Keith Thurman is the only unified 147-pound world champion and the consensus No. 1-ranked fighter in boxing's preeminent weight division. The undefeated Thurman(28-0, 22 KOs) has held the WBA title since 2015. He claimed the WBC belt with a decisive win over previously undefeated Danny Garcia last March in the most watched bout of the year, a presentation of SHOWTIME Boxing on CBS. Following an elbow injury that required surgery, Thurman will return to action against an opponent to be determined. WBC Light Heavyweight World Champion Adonis Stevenson (29-1, 24 KOs) has scored knockouts in six of his eight title defenses and will face perhaps his toughest challenge when he battles two-division champion Badou Jack (22-1-2, 13 KOs).Jack captured a 175-pound world title in his light heavyweight debut in August and relinquished the belt in order to immediately make this matchup of top-five ranked light heavyweights. After their 2015 title showdown brought the Staples Center crowd to its feet, WBA Featherweight Champion Leo Santa Cruz (34-1-1, 19 KOs) and three-division world champion Abner Mares (31-2-1, 15 KOs) will meet again in their shared hometown of Los Angeles. Santa Cruz, who also has held titles in three divisions for the past six years, remains one of the most prolific fighters in the sport today. Mares, a former world champion at bantamweight, super bantamweight and featherweight, aims to exact revenge after the close majority decision loss to Santa Cruz in 2015. This high-stakes matchup between consensus top-five ranked featherweights will give further clarity to a stacked division that includes Gary Russell Jr., Carl Frampton and Lee Selby. The consensus No. 1 fighter at 154 pounds, Jermell Charlo (30-0, 15 KOs) will defend his WBC Super Welterweight World Championship in the co-feature against an opponent to be determined. Fresh off a dominating performance against a top-10 former welterweight champion, pound-for-pound great Errol Spence Jr. (23-0, 20 KOs) returns to his hometown of Dallas for the second defense of the IBF Welterweight World Championship. With such an impressive schedule planned, boxing fans should be very excited. Many of the fights lined up, will help to shape the sport going forward and will provide fans with another classic year of boxing.